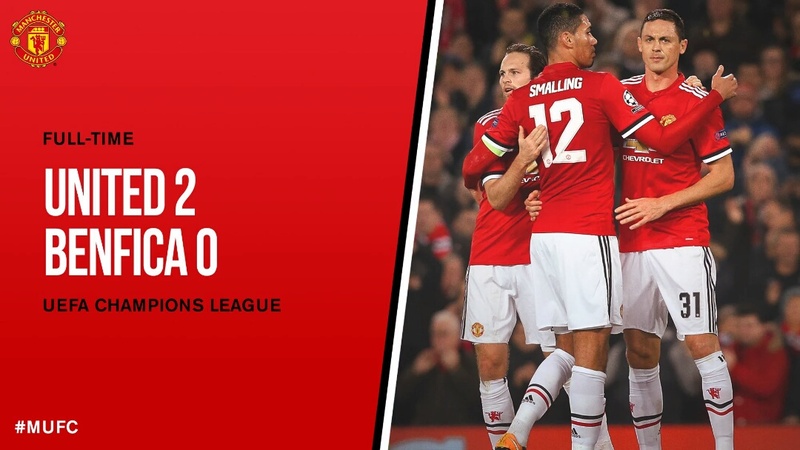 Manchester United maintained an exemplary start in the UEFA Champions League with a fine 2-0 win over Benfica, courtesy of a first-half own goal from Mile Svilar and a second-half penalty by Daley Blind. The match started in lively fashion as the two teams looked to take a stranglehold of the game in front of a boisterous Old Trafford crowd, and both sides had chances early on, with Anthony Martial and Andreas Samaris each firing high and wide. However, United Had A Golden Opportunity To Take lead in the 15th minute when, following a superb driving run from Martial, the Frenchman was felled by Douglas, who then handled the ball. The attack resulted in a penalty being awarded for the Reds - but unfortunately for the home fans, Martial's spot-kick was saved by 18-year-old Svilar. David De Gea and Svilar then traded saves, as the Spanish stopper acrobatically denied Diogo Goncalves, and the Eagles' keeper tipped a Romelu Lukaku effort round the post on the half-hour mark. Following Lukaku's attempt, United went up a gear, and a period of dominance in terms of possession and territory ensued. The pressure eventually told, as in the 45th minute, Matic picked up the ball in space and lashed a low shot from 25 yards out, which struck the post and ricocheted in, off Svilar's back. The Reds began the second half on song, and after a finely weighted ball from Lukaku, Martial was left in space in the Benfica box but he was unable to unleash a shot. United's no.1 again proved crucial on the hour-mark, as De Gea tipped a fierce strike from Goncalves around the post. However, the Spaniard was left watching on shortly after, as Raul Jimenez struck the post after intercepting Eric Bailly's wayward pass. Birthday boy Marcus Rashford entered the fray with 15 minutes left on the clock, and the striker made an immediate impact by winning United a second penalty of the match, following a mazy run into the Eagles' box - and this time it was Daley Blind who stepped up to fire home and double the Reds' advantage. With the score at 2-0 the Reds only grew in confidence until the game eventually drew to a close, with passage into the knockout rounds all but secured for Mourinho's men after CSKA Moscow also won, 2-1 away to Basel in the night's other Group A game. United: De Gea; Darmian, Bailly, Smalling, Blind; Matic, McTominay; Mata (Herrera 67), Lingard (Mkhitaryan 46), Martial (Rashford 75); Lukaku. Subs not used: Romero, Lindelof, Shaw, Young. Benfica: Svilar; Douglas, Ruben Dias, Jardel, Grimaldo (Eliseu 62); Fejsa, Filipe Augusto, Pizzi (Jonas 80); Salvio, Diogo Goncalves, Raul (Seferovic 75). Subs not used: Julio Cesar, Lisandro, Samaris, Cervi. Another clean sheet for De Gea - the Spaniard's performances have been brilliant this term - leading to many heralding him as the world's best goalkeeper, and his performance tonight only furthered those claims. Both of his saves to deny Goncalves were right out of the top drawer - the first a show of exceptional athleticism, and the second an illustration of his top-class reflexes. The Academy graduate impressed in the middle of the park, particularly towards the end of the first period, when he seemed to grow in confidence immeasurably. Whether it be in the tackle, or finding a team-mate, McTominay did not look out of place whatsoever and Mourinho now knows the no.39 is a safe pick, whenever he is required to play. Daley Blind became the 11th different player to score for United this season, while the unfortunate Benfica goalkeeper Mile Svilar contributed the first own goal to the Reds' cause in 2017/18. The Reds' attentions turn back to the Premier League on Sunday, when Mourinho's men travel to the capital to face Chelsea. The match will take summer signings Nemanja Matic and Romelu Lukaku, as well as Juan Mata and Mourinho, back to their former club, as United look to build on last weekend's impressive 1-0 win over Tottenham.